To the official website of "The Class of '58". The Coleman family are "The Class of '58". 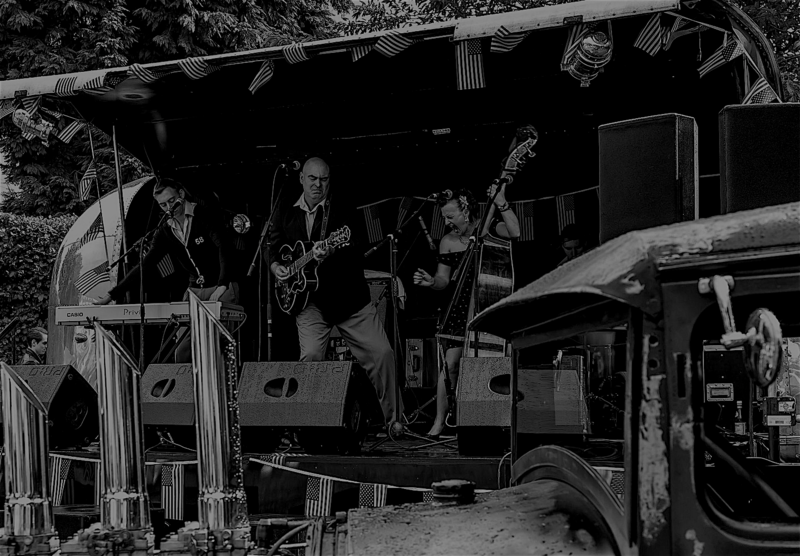 The Class of '58 are recognised as one of Europe's Premier and Best Loved 50's Rock & Roll and Doo Wop bands and consists of Howie (Dad) on Guitar/Vocals, Chris (Mam) on Double Bass/Vocals, and their sons Johnny, on Drums/Vocals and Davie on Piano/vocals. The band, this year, are celebrating 16 years of playing together - and still going strong! The Class of '58 are probably the most versatile, hard-working and most unique band playing '50's Rock 'n' Roll music today. 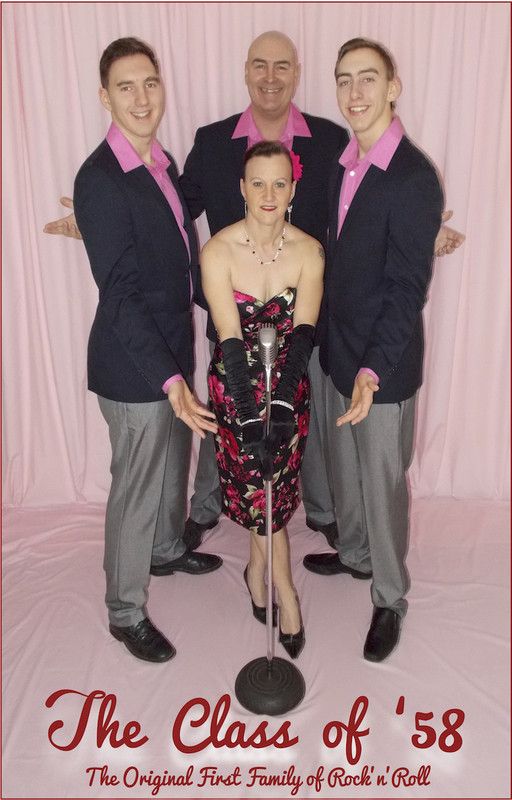 Versatile - because their set consists of the whole spectrum of '50's music - Doowop, Jive, Boogie Woogie, Rockabily, Classics and more! Hardworking - because their Gig List is a testament to their desire to put their music out there, which is reflected by how busy they are! Unique - because the band is made up from all the members of the complete family unit - Mam, Dad and 2 sons. Whereas it might not be too unusual to come across bands occasionally with siblings, a relative, or one parent in, an ENTIRE complete family is both rare and unique - especially playing '50's Rock 'n' Roll! Many years ago, a well respected veteran of the music industry christened them "The First Family of Rock 'n' Roll", which is a badge that they're proud to wear to this day. They were the first entire family to play together in this genre of music and they paved the way for others to follow. Thus making it more acceptable for promoters to give other youngsters a chance to play - After all the lifeblood of any music is youth!!! Charlie Gracie once said : " They sound like they've been playing together for 40 years! " - and that was a long, long time ago, when the boys were still in Primary school!! The band has and continues to tour extensively throughout Britain, Europe and the rest of the World, playing anywhere and everywhere - From Cruise Ships to Festivals, VIP & Corporate Events to Holiday Resorts and Hotels, Motor Shows to Rock & Roll gigs and Jive Clubs and many other events! Earning the reputation as a high quality band that always comes up with the goods! Whether you want to dance, or just watch the show, this is the band for you! A great night is always guaranteed. The Von Trapp's never sounded like this! Jan 31st 2017 European Dates AnnouncedToday we're pleased to announce the details of some of our European dates for this year, 2017. We will be performing in a number of different countries across Europe. There will be other dates announced over the next few...... Click to read more. We are pleased to unveil our brand new, updated website! It's taken a little while to get it all sorted but it's finally online. Everything has been updated so you'll find new content wherever you look! There will be more updates to the site shortly so....... Click to read more.